Stedam Cattery specializes in only American Shorthair cats because we feel we have the purrrr-fect breed of cat, so why have anything else? We have been breeding for almost 20 years. Our cats’ accomplishments speak for themselves. We are the breeder/owner of 24 CFA National Winning Cats, Kittens or Premiership cats. We have bred/owned about three dozen Regional Winners and over 175 Grand Champion/Grand Premiers. 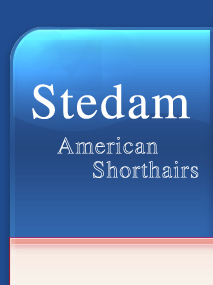 Stedam Cattery is the breeder/owner of 16 DM cats. We are a small cattery that focuses on quality animals and not quantity. 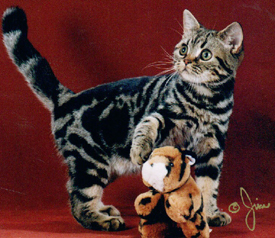 We frequently sell our very best, and many of our cat's wins were earned while being shown by other owners. What do these accomplishments mean to you? It means, as a family we have worked on our breeding program to produce not only beautiful cats, but cats with wonderful temperaments. You can have the most beautiful show cat in the world, but if it doesn't want to show, that's the end of its career. This breed is known for their outgoing pleasing purrsonalities. Not only is that a genetic trait, but it is also an environmental factor. Our cats/kittens are raised in the house as part of the family. Kittens are handled constantly from the minute they are born so that a social interactive kitten is produced, no matter if it is pet or show quality. Stedam Cattery also stresses the importance of health in our breed. We are a Feline Leukemia, FIP and ringworm free cattery. A stress free environment allows our kittens to grow to their fullest potential. Maintaining a healthy cattery is a full time job, but it allows the kittens to bloom while they are here so that they can go to their new homes happy and healthy. The kittens/cats come with a written health guarantee. We ask that the animal be altered, (neutered or spayed), by the time it is eight months old. All cats or kittens are required to be strictly indoor pets. This keeps your cat/kitten away from unseen danger and unwanted health risks. In return we agree to sell you an animal that is healthy and free from infectious disease. All cats and kittens leave Stedam Cattery with all required vaccinations appropriate for their age. Now that you’ve chosen your breed of cat, how do you go about acquiring one? 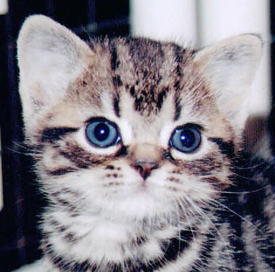 Stedam Cattery requires a $50.00 deposit on a kitten of your choosing. This is applied to the purchase price of your new kitten. We would like you to contact us by phone so that we can discuss any special requests or concerns that you may have. This also gives us a chance to get to know one another. Of course, you are always welcome to come and visit the cattery in person if you are able. Visiting the cattery allows you the ability to get to know the breed better and see how our kittens are raised. We like to work with our kitten buyers so that they are confident in their selection.